Discontinued Turntables D to G - audiotools.com. This company was the hardware arm of the Nippon Columbia records label and as such supplied the Asian broadcast industry with record players and associated products for decades before being known in the west. This was demonstrated by a range of consumer turntables that had a clear linagage from the broadcast tables, including heavy plinths with directly driven platters and full automation, some models even sensing the size of the disk automatically. 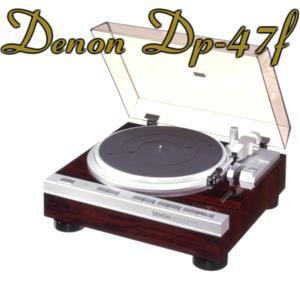 The DP-47F was a long running model that was not discontinued uthil 2004 that is in design pilosophy almost an exact opposite of it's western counterpart and was when it was deleted the last consumer turntable available with a servo tonearm. It features a fully automatic operation, the table is driven by a heavy tourque directly coupled linear drive phono motor. The midi sized record player called DP-26F was dropped from the catalouge at a similar time, this a budget automatic player with a built in RIAA preamp that has got rave reviews for such a cheapc player, note that the preamp is not perhaps the best in the business so if you amp has a resonable quality phono input you should switch it out and since this is inended to be a foolproof system there is no provision for adjusting the anti-skating so you are severly limited in replacement pickup choise, but that should not be an issue in this pricerange. The company also made a short stop in the DJ market in around 2003 with a couple of models, they were both direct drive turntables, the more upmarket model was the DP-DJ151 which features a digital output (yes, there is a built in A/D) and the DP-DJ101 turntable, both came with a 78 rpm option. The Dual Classics Homepage is a great page on classic DUAL gear, focuses mostly on turntables and then only on models that were sold in the US, but great stuff nevertheless, this German language site has info also but is often down. Models missing from those 2 sites include the CS 400 but that is a small automatic turntable introduced in the mid 90's and intened for use with Midi music centres and thus came with a built in RIAA preamp, its not as good as the classic Dual models but above average for this type of a deck, it was discontinued in 2002 or so and replaced with the broadly similar Dual CS 410. The CS 435 is the predecessor to the current Dual CS 435 1 model and is mostly identical the most notable differences being the platter mat which is a grooved rubber thingy on the 435 model but a felt mat on the 435 1 but visually you can identify the difference by the white line that runs along the front of the original model while the modern variant is plain black, they do sound very similar though with the current model having a slight edge. Note that Audiokit in Italy have NOS Dual EDS 502 motors in stock for only 28 €, this was used in many DD decks such as the CS 617Q. They made turntables right from the 1948 up to 1980, these were popular in the 50's and 60's in the US under the Miracord brand (that name was used as a model or family type in Europe along with Miraphon and Mirastar) and early Realistic branded turntables were also made by this company. Made the Rock turntable in the early 80's and a Rock MkII a little later, this was an unusual deck that created quite a stir in the hi-fi press at the time but did not sell in any great numbers possibly due to it's introduction coinciding with the height of the British LP12 mania and shortly thereafter the introduction of the CD. The deck was based on a design from the Cranfield Institute of Technology but they had given a group of engineering and design students the task of designing a superior quality turntable and the order of the day was to rethink turntable design from the ground up in order to archive the task. Most of the design features of the Rock aren't that unusual, it does features a quality inverted main bearing better than most at the time but one very unusual approach was taken and that was in the form of the "trough", it's a silicone filled plate made out of cast metal, a spindle is then fitted to the headshell of the tonearm, this trough is swung over the record and dampens the tonearm at the headshell rather than at the pivot as is more usual, sounds scary but worked like a charm, typically driving resonance to or below 10 Hz. The only component on the Rock is bog standard is the Philips (Airpax) 24 pole synchronous AC motor that appears to have found it's way into the majority of late 20th century British turntable designs, this is not necessarily a minus since many owners use after-market power supply's intended for Linn LP12 and suchlike to upgrade their Rocks and additionally filtering supply's such as the one from Nottingham Analogue will work as well. The lid was an optional extra BTW so many items on the second hand market will not feature one, and differences between MkI and II versions ? No clue except that the power switch on MK one models was green and red on the later ones, useful info as always. The old Empire turntables have something of a cult following amongst Americans, the Atma-Sphere company in fact makes a high end deck that utilises parts from the old Empire 208 models, you can contact them to see if they also modify existing decks. This page here hosts pics of an NOS 298 Empire table bought recently and here are pictures of a 1962 model. As far as I can gather the first deck from the company was the aforementioned 208 first introduced in the late 50's, it's a fairly conventional unsupended design except for the belt drive that was something of a novelty in those days, this was followed by the 298 at around the turn of the decade and the 398 an little later, while the previous 2 models were mostly sold without arm the 398 appears to have benn sold with an Empire 980 arm as standard, the 498 also appears to have come with that arm, it was introduced in 1963 and cost 170 USD when new, the 598 appears similar to the 498 except that it came in an enclosure similar to what was used on some Garrard decks at the time, the cover was not hinged but rather you took it off when you used it (earlier Empire decks did not come with a cover), this model appears to have survied well into the 70's and was available in a MkII and MkIII versions, the 698 appears to be a suspended design. A great page on EMT broadcast turntables can be found here. Stefano Pasini also has some info on his homepage. In addition Dr. Feikert GbR has some spares for the range esp. the 938. An owner of a 928 has a picture of it here along with technical information on the EMT Tondose :). Finally the EMT company also manufactured the Thorens TD-150 in the early to mid 60's, not as has been suggested a cheaper alternative to their other models, but simply since EMT-Franz was a part of the Thorens-Franz group and handled the initial production runs of the 150 in Germany, these "EMT" models are identical to the normal TD-150 models except that under the Thorens name is the phrase "Made in Germany by EMT", there are some claims about a better build quality of the EMT models but that appears to a misunderstanding. There is a great interest in EMT decks amongst 45 Rpm. collectors, in particular in the later models and that has pushed the price up considerably. Spares & service : Studiotechnik Dusch provides spares for most EMT turntable models and in addition they sometimes have refurbished units for sale, more info on available parts here in addition they manufacture improved parts for the 928, 930 and 938. Released the Partheon and the Partheon Jr. in 1972, this was one of the first high end turntables and probably the first heavy platter deck intended for home usage rather than as a transcription deck, many of its features such as the independent motor have been copied ever since, more info on their homepage. Introduced the Air Reference in the early 80's and was widly hailed then as the best turntable available. It was the first air bearing turntable to hit the market that was resonably realiable but like most others of it's ilk it coulnd be somewhat bothersome to set up. It was usually sold as a combination of the Air Reference turntable and an arm of the same name, but that is and linear air baearing unit. The turntable was improved trough the 80's and 90's with amongst other thing an optional flywheel and sundry other changes, it had by 2000 reached the Mark V gusie, the company is still making the deck in an updated version called Forsell Reference Series Turntable. East German (DDR) manufacturer that made record players both standalone and as a part of systems, distributed under the state brand RFT and under their own Ziphona brand. The DDR Alltagskultur site has pictures of their 70's and early 80's era models here and here, and the Oldtimer Radio site has a list of most record players that were made in the DDR. If you are interested in some of the later Garrard models you can start by taking a look at the retro-review of the Zero 100 by TNT audio that appeared in 3 parts, Part 1, Part 2 and Part 3, the article also has some modification tips, but also some factual errors. If the Zero 100 catches your fancy you should note that there were 3 distinct models on the market and even more variations. Introduced the Studio in 1979 and started producing it in 1981 following with the Reference in 1983, it was along with the Nakamichi turntables the first turntable to utilise computer control, also noted in it's day for being the most expensive turntable you could buy, and at over 100 kg the heaviest one as well. Sold well in the US.